Wolfhound Media are delighted to announce ‘The Dig’ has won Best Film at the 30th Galway Film Fleadh in a ceremony attended by the President of Ireland, Michael D Higgins. The Dig is produced by Out of Orbit Productions in association with Wolfhound Media and directed by Andy and Ryan Tohill. It was financed by Northern Ireland Screen and Yellowmoon. 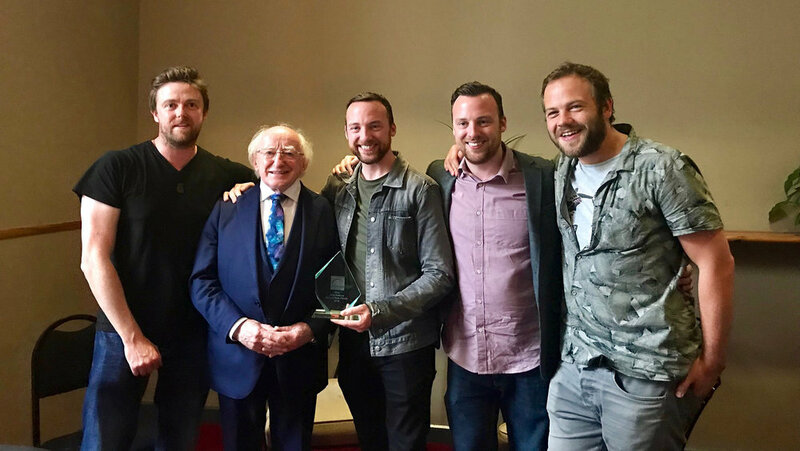 L-R Brian Falconer (Producer, Out of Orbit Films), Michael D Higgins (President of Ireland), Ryan and Andy Tohill (Directors) and actor Moe Dunford (Ronan Callahan). This journey of this film started on the fifth of November 2013 when Alison Millar’s ‘The Disappeared’ was broadcast on BBC4. During the programme one of the contributors sorrowfully stated ‘I don’t care about justice any more, I just want closure’. It was that heartfelt, and emotionally loaded, quote that inspired the creation of ‘The Dig’. Development on the project started in August of 2014 with the assistance of Northern Ireland Screen. As with most projects a lot changed during the early drafts but never the core concept, this was always a film about how to get passed the past, a theme that resonates in the post-conflict Northern Ireland of 2018. I’d seen very little of Ryan and Andrew Tohill’s direction and yet there was something about their style that had stuck with me. They were my first choice to direct and throughout the entire project they have shown themselves to be the best choice. As the project reached the third draft it was time to bring Brian J. Falconer of Out of Orbit Productions on board as producer. From the moment I met Brian it was his hunger, not only to produce his first feature, but also for the project itself that excited me and convinced me he was the man for the job. As we progressed toward the green light and production, I worked very closely with Katie Boyles, our Story and Script Editor. It was during this time that we took the script from good to great. We toiled over each word, each plot-point, each piece of dialogue’s inclination, style, subtext. Katie elevated this project and elevated my writing. The odd thing about writing a film is there comes a point when it’s no longer yours but becomes the directors’. This is a transition that can cause a lot of anxiety. Thankfully it was seamless for us as Andrew and Ryan Tohill consistently made every moment of the script better. The shoot was tough, very tough. November on an Irish bog isn’t for the faint of heart. It was literally freezing. The cast and crew all toiled through that hardship and I believe they have produced something really special. During the shoot, Wolfhound’s very own Alasdair not only recorded the Electronic Press Kit but also all of the film’s aerial cinematography. The project has an epic size, scale and themes and all the photography needed to match that. The Director of Photography Angus Mitchell rose to that challenge and so did Alasdair. Every frame in the film is beautiful. As the film begins what we hope will be a long and successful festival run, our focus becomes the future. ‘What’s next?’ There are new ideas bubbling away, not just for film but also television. I want to work with Brian, Ryan, Andy and Katie again and as I promised our 2nd Assistant Director as he trundled off the mud soaked bog, it’ll be in a warmer location.